A regular perfective verb الفِعْل المَاضِي الصَّحِيْح, explained in a previous lesson, is the verb that does not include a long vowel حَرْفُ عِلَّة (i.e. و ، ا ، ي). The absence of the long vowel makes its conjugation with different persons / pronouns straightforward. That is, the root verb does not change when pronoun suffixes (or affixes) are added. By contract, the irregular perfective verb الفِعْل المَاضِي المُعْتَل includes one or more long vowels as part of the root. For now, let’s look at the verbs that have one long vowel. This vowel can be at the beginning of the verb (i.e. وَعَدَ, وَصَلَ, وَجَدَ), in the middle (i.e. قَالَ, خَافَ, صَامَ), or at the end (i.e. جَرَى, دَعَا, مَشَى). هَلْ دَعَوْتَ أَحْمَد؟ – did you call Ahmed? هَلْ فُزْتُنَّ؟ – did you win? From the examples in the table above you can see that some verb roots change, while others don’t. The change can be dropping a letter or changing a long vowel to another. No change occurs with the verb that start with the vowel (which is always و). The attached pronoun is simply added to the end of the verb, like we do with regular verbs. The middle vowel is mostly an alif. When added, attached pronouns trigger a sukuun on the last letter of the verb (here the ل). The letter before ل is alif, and it has a sukuun over it. Generally, a sequence of two sukuuns in Arabic is prohibited; therefore, the first is always dropped. So, alif in قَالَ is dropped. With هُوَ, هِيَ, and هُم, the ل does not have a sukuun over it, so alif is retained. جَرَى ends with alif layinah (i.e. ي-shaped without the two dots). 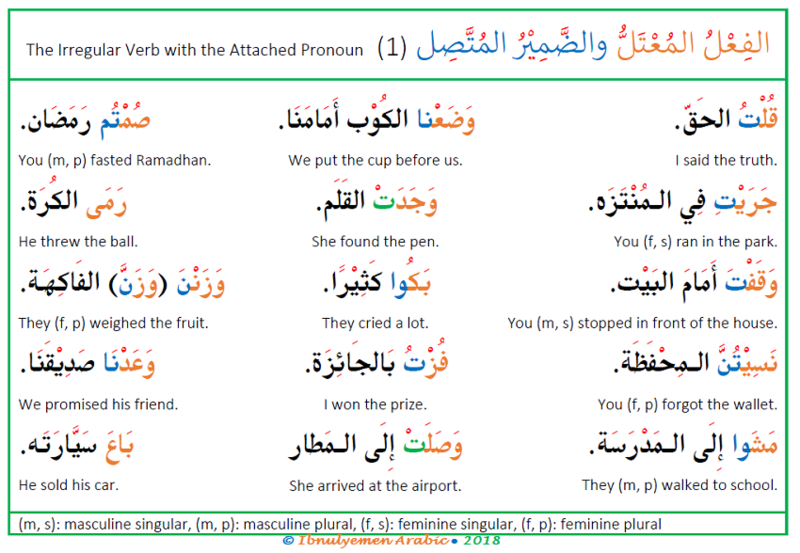 When attached pronouns are added, it changes to regular ي except with هِيَ and هُم. With هِيَ, verbs end with تْ with sukuun. With هُم, verbs end with ـوا with sukuun on the و. The يْ with sukuun before تْ and ـوا is dropped for the sequence of two sukuuns. دَعَا end with alif madd. When attached pronouns are added, it changes to و. With هِيَ and هُم, it is dropped for the sequence of two sukuuns. Note: The verb with هُوَ is the root as it does not have any suffixes. The subject with this verb is covert مُسْتَتِر understood as هُوَ. Also, the verb with هِيَ has تْ. This تْ is not the subject; it is the feminine marker, and the subject is covert مُسْتَتِر inferred from the تْ as هِيَ. Review the conjugation of verbs in the first two tables to fully understand and apply the rules.